CONGRATULATIONS PAKISTAN. Decades pass and then ONE GOOD News ? Pakistan HAS NO Money to BUILD future of PAKISTANIS. 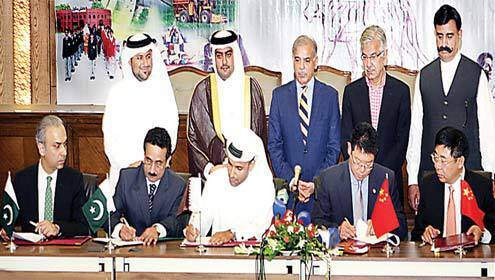 Pakistan needs FOREIGN AID investment from UAE to CHINA’s skills to build BASIC RUINED NEEDS of Electricity. And THEN will COME time to COLLECT electricity BILLS of these GENERATORS. In 20 years of OPERATION these PLANTS will have NO Spare Parts. Like RAILWAY of today. This is NOT proud photo of Pakistani ACHIEVEMENT !!! Just a ruined little electricity COLLECTION ability country thinking CHEAP future ELECTRICITY !!! NO MULLAH, or DEAD ZIA ul HAQ or PPP or PML or PTI or USA or SAUDIA can PROVIDE you CHEAP CHEAP electricity. Its just BRAINWASH ruined MENTALITY that we even think ELECTRICITY is like a bus or car = Foreign QUALITY countries can send you on SHIPS. Price Controlled ELECTRICITY is like Pak Railway and Pak Schools = LISTEN = you get what you pay for. More Zias and more Osamas but no QUALITY. Look at Price Controlled RAILWAY and FAILED CHEAP SCHOOLS and HOSPITALS for majority of Pakistanis. LAHORE: Corruption and misuse of power within press, acquisition of wealth and exploitation by journalists for personal gains are elucidated in detailed in the book “Press, Pressmen and the Governments in Pakistan: Mishandling of Power and Positions”, published by the Higher Education Commission of Pakistan. Different cases of corruption of journalists such as acquiring financial gains, getting high official posts, multiple plots, and foreign trips are discussed in various chapters of the book. The book has been published by the HEC Pakistan and authored by Dr Shahzad Ali, distinguished assistant professor of Department of Mass Communication Bahauddin Zakariya University, Multan and co-author Prof Dr Muhammad Khalid, Chairman Department of Mass Communication, University of Management and Technology, Lahore. The authors have dedicated the book to Habib Jalib calling him a “zealous revolutionist”, who believed that reticence is a sin’. The book starts with discussing perception and notions about press freedom, as well as the media boom in Pakistan over the last decade. The opening remark of the book is a quote by Surin Pitsuwan, Thai Minister of Foreign Affairs, who said, “No nation is so poor that it cannot afford a free press. In fact, the poorer you are, the more you need a free press,” highlighting the need of free press especially in developing countries such as Pakistan. Different atrocities against press and freedom of speech in Pakistan are also discussed throughout the book, including violence against journalists, which continue to this day in different parts of Pakistan as a tool to keep the press in check and silence others who might raise their voices. The most interesting part of the book is frank discussion and disclosure of corruption, misuse of the power by journalists. Details of many journalists’ and corruption have been discussed in the book with clear mention of their names as well their relatives who gained illegal advantages. The book highlights the current as well as the historic situation of media in Pakistan, while focusing on the press freedom and developments and changes during different regimes in the country. Violence suffered by the press as well as cases of yellow journalism and bad practices are also discussed with details in seven chapters of the book. Evolution of media laws in Pakistan are discussed and analysed in great details in the beginning chapters of the book, which also highlights the concerns and interests of different regimes in the country. Another aspect of the book is the chronological analysis of the media, which helps in understanding different phases of press in Pakistan. In the preface of the book Dr Shahzad states that ‘most of the books published in Pakistan have deliberately or unconsciously overlooked the negative role of media practitioners. The primary objective of all previous books had been to highlight the severe actions of successive regimes, irrespective of democratic or autocratic in curbing the freedom of press. The ruling Junta was portrayed as a villain, oppressive, and fascist in a derogatory manner, whereas the media groups and their working journalists were depicted as custodians of constitution, of law, of human rights, and above all as comrades fighting for the rights of less privileged classes. ‘Press, Pressmen and the Governments in Pakistan: Mishandling of power and positions’ can undoubtedly be called the most in-depth look into Pakistani media, as it covers each and every historic event of press’ life in Pakistan. Reasons for declining fertility rates in Pakistan. KARACHI: Pakistan is sixth most populous country in the world with an estimated population of 184.35 million in 2012-2013. The growth rate of population during 2012-2013 is 2.0 percent. Under current circumstances, it is expected that Pakistan will attain fifth position in the world in terms of total population in 2050. According to new Economic Survey of Pakistan 2012-13, the comparison of population data published by Population Reference Bureau shows that the world population growth rate reduced from 1.4 percent in 2011 to 1 percent in 2012. Nevertheless the decreased growth rate added 71 million people in global population, and the total world population crossed the figure of seven billion at the end of June 2012. Each year the number of human beings is on the rise, but the availability of natural resources, required to sustain this population, to improve the quality of human lives and to eliminate mass poverty remains finite. Resultantly, these resources are becoming scarce and incapable of fulfilling ever increasing demand of population. The main affectees of increasing population are the developing countries where population growth rate is higher than developed countries while availability and use of natural resources is scarce as compared to developed world. However, this issue can be handled by advancement in technology and human resource development. Increased investment in the technological development and higher labour productivity through improvement in education, health and training facilities are the main modes of increasing productivity of human resources. People are living longer in both industrial and developing countries because of increased access to immunisation, primary health care, and disease eradication programs. In Pakistan, life expectancy has also increased from 65.8 (female) and 63.9 (male) in 2010-11 to 66.1 (female) and 64.3 (male) in 2011-12. Age composition of a population is the number of people in different age groups in a country. It is one of the most basic characteristics of a population. A person’s age influence what he needs, buys, does, and thinks. The study of age composition of population is also helpful in determining the proportion of the labour force in total population. It also facilitates in understanding about the dependent population, longevity and aged population. According to age composition, population of a nation is categorized into three broad groups. These are Children (young), adult (middle age) and aged (old age). The adult population is considered as wealth of a nation in terms of human resource. Adult population (15-59) has increased from 104 million in 2011 to 110 million in 2013. This age structure of a population affects a nation’s key socioeconomic issues. These people are economically productive and they comprise the working population. Nevertheless, the rapid growth in this group can become problematic, if they are unable to find employment. However, the government with appropriate polices can utilise this youth bulge for the development of the economy. The population in third group (60 years and above) has shown a mild increase i.e. less than one million during 2011 to 2013 period. Total fertility is a general term covers the relationship between the current population (typically the current female population) and current numbers of births. Total fertility rate represents the number of children that would be born to a woman if she were to live to the end of her childbearing years and bear children in accordance with current age-specific fertility rates. The fertility rate has rapidly declined in those countries which achieved major improvements in child survival rates and educational levels and have implemented family planning programs as well. Nothing ruins a nice dinner party quite like discussing economics and fiscal policy. Blood boils, friends become enemies and no one bothers touching dessert. In the United States the rancor and gnashing of teeth over such matters reached a fever pitch during the 2012 elections and still carries on through negotiations over the federal budget. Questions about the role of spending and debt are a global issue, but the core issue isn’t how much to spend or what to spend it on as much as it is on whether debt is inherently bad. Tensions over just how to handle debt are pitting the rich world against the developing world like never before. Researchers often focus on the debt of developing countries rather than the debt of the rich world. To a certain extent this makes sense considering that developing countries can be neophytes when it comes to managing external debt and the flow of money. Developing country governments are faced with an ever-broadening array of financing options and may find themselves on the verge of a debt crisis, without strong institutions and policies in place to keep debt in check. The argument posited by international organizations such as the IMF and World Bank, as well as rich world crediting nations, is that developing countries should follow the sort of policies described in the Washington Consensus. The 2008 global crisis has turned the argument on its head, however. According to the IMF, general government gross debt for advanced economies grew from 72.5% of GDP in 2000 to 109.9% in 2012, with much of that increase occurring after 2008. During the same period, emerging markets and developing economies saw their percentage drop from 36.6 to 34.4%. Of the 35 countries considered advanced by the IMF, all but nine are in Europe, which has yet to right itself four years into its sovereign-debt crisis. Between 2008 and 2011, 13 European countries – half of all European countries considered advanced – had increases of general government gross debt exceeding 40%. In short, some developing economies are less indebted than developing ones. Arguments over debt tend to focus on government debt, with particular focus on government debt as it relates to GDP. While high-debt ratios do indicate a greater claim on future growth by creditors, since debt requires service payments, focusing solely on government debt misses the other elephant in the room: private sector debt. To illustrate how focusing solely on government debt can turn into a Titanic-meets-iceberg moment, Cyprus, the small island nation now dominating financial news, was flying under the radar with a debt ratio of 61% in 2010 (compare this to 98% in the United States). What everyone missed was that its banking sector debt was nearly nine times its GDP in 2010; the eurozone average was 334% in 2010. Governments – and ultimately taxpayers – face two issues when it comes to debt. High government debt means that a greater portion of tax revenue has to be earmarked for debt service payments. This reduces funds for other programs. High private sector debt, while ostensibly backed by investors in the companies taking on debt, can wind up pulling in the government. Hence the popularity of the “too big to fail” quote. In some respects private sector debt is more frightening than public sector debt, since a government keeping a tight fiscal ship won’t have as much of an impact (hence monetary policy). For example, a banking crisis in the private sector can cause business credit to seize, unemployment to spike and bankruptcies to ensue. This in turn would lead to decreased tax revenue, which would lead to a vicious cycle of cuts and contraction. For many developed nations with sophisticated banking systems, a good portion of private sector credit comes from within. A review of World Bank data on domestic credit to the private sector shows that 23 developed economies had ratios greater than 100% of GDP in 2011, with five countries – Cyprus, Denmark, Ireland, Spain and Hong Kong – with ratios greater than 200%. This matters because a private sector failure, such as a collapse of several big banks, will hit residents harder. This is part of the reason the European Central Bank is at odds with Cyprus: domestic depositors don’t want to take a hit. How well a country manages its finances is rarely addressed until something goes wrong. In this sense, strong institutions and close vigilance can reduce the possibility of failure, but incentives often align to push governments toward policies that may kick problems down the street, rather than face them in the present. America allowed loose credit leading up to the financial crisis, while Cyprus basked in the warmth of being considered a banking haven. Debt statistics matter, but the complex workings of economics makes them only part of the overall picture. Investors looking to take advantage of growth opportunities while reducing risk have a tough task ahead of themselves. The interplay of economic indicators is complex, but some general rules of thumb apply. Countries can run deficits, but just like the average Joe must be able to weigh the cost of borrowing with future growth. The higher the ratio of debt to GDP the more likely a country is to get into trouble. For the optimist, looking into countries with healthier balance sheets will bring more stability, but with reduced risk comes slower growth. For the pessimist, investing against the negative consequences of a country running a greater deficit can mean taking positions that profit from increases in interest rate spreads. Investors can also look to currency trading to take advantage of a possible default. Current Account Deficits: Government Investment Or Irresponsibility? The current account is a section in a country’s balance of payments (BOP) that records its current transactions. The account is divided into four sections: goods, services, income (such as salaries and investment income) and unilateral transfers (for example, workers’ remittances). A current account deficit occurs when a country has an excess of one or more of the four factors making up the account. When a current transaction enters the account, it is recorded as a credit; when a value leaves the account, it is marked as a debit. Basically, a current account deficit occurs when more money is being paid out than brought into a country. A current account deficit implies that a country’s economy is functioning on borrowed means. In other words, other countries are essentially financing the economy, and hence sustaining the deficit. When determining the economic health of a nation, it is important to understand where the deficit stems from, how it’s being financed and what possible solutions exist for its alleviation. To do so, we need to look at not only the current account, but also the other two sections of the BOP, the capital account and the financial account. Foreign funds entering a country from the sale or purchase of tangible assets – as opposed to non-physical assets such as stocks or bonds – are recorded in the capital account of the BOP. (Again, money entering the account is noted as a credit, and money leaving the account is a debit.) Financial transactions such as money leaving the country for investment abroad are recorded in the financial account. Together, these two accounts provide financing for a current account deficit. Why Is There a Deficit? Is a current account deficit simply a matter of a government’s bad planning and/or uncontrollable spending and consumption? Well, sometimes. But more often than not, a deficit is planned for the purpose of helping an economy’s development and growth. It can also be a sign of a strong economy that is a safe haven for foreign funds (we’ll explain this below). When an economy is in a state of transition or reform, or is pursuing an active strategy of growth, running a deficit today can provide funding for domestic consumption and investment tomorrow. Here are some of the types of deficits, both planned and unplanned, that countries experience. Instead of saving money now, a country could also choose to invest abroad in order to reap the rewards in the future. The outing funds would be recorded as a debit in the financial account, while the corresponding incoming investment income would eventually be earmarked as a credit in the current account. Often, a current account deficit coincides with depletion in a country\’s foreign reserves (limited resources of foreign currency available to invest abroad). When foreign investors send money into the domestic economy, the latter must eventually pay out the returns due to the foreign investors. As such, a deficit may be a result of the claims foreigners have on the local economy (recorded as a debit in the current account). This kind of deficit could also be a sign of a strong, efficient and transparent local economy, in which foreign money finds a safe place for investment. The United States capital market, for example, was seen as such when “quality assets” were sought out by investors burned in the Asian crisis. The U.S. experienced a surge of foreign investment into its capital markets. And while the U.S. received money that could help increase domestic productivity and hence expand its economy, all of those investments would have to be paid off in the form of returns (dividends, capital gains), which are debits in the current account. So a deficit could be the result of increased claims by foreign investors, whose money is used to increase local productivity and stimulate the economy. Sometimes governments spend more than they earn, simply due to ill-advised economic planning. Money may be spent on costly imports while local productivity lags behind. Or, it may be deemed a priority for the government to spend on the military rather than economic production. Whatever the reason, a deficit will ensue if credits and debits do not balance. Funding channeled into the capital and financial accounts (remember, these accounts finance the deficits in the current account) can come from both public (official) and private sources. Governments, which account for official capital flows, often buy and sell foreign currencies. Credit from these sales is recorded in the financial account. Private sources, whether institutions or individuals, may be receiving money from some sort of foreign direct investment (FDI) scheme, which appears as a debit in the income section of the current account but, when investment income is finally received, becomes a credit. To avoid unnecessary extra risks associated with investing money abroad, the financing of the deficit should ideally rely on a combination of long-term and short-term funds rather than one or the other. If, for example, a foreign capital market suddenly collapses, it can no longer provide another country with investment income. The same would be true if a country borrows money and political differences cut the credit line. However, by planning to receive recurrent investment income over the years, such as by means of an FDI project, a country could intelligently finance its current account deficit. In times of global recession, the financing of a deficit can sometimes be traced to capital flight, that is, private individuals and corporations sending their money into “safe” economies. This money is recorded as a credit in the current account but, in reality, it is not a reliable source of financing. In fact, it is a strong indication that the world economy is slowing and may not be able to provide financing in the near future. In order to determine whether a country’s economy is weak, it is important to know why there is a deficit and how it is being financed. A deficit can be a sign of economic trouble for some countries, and a sign of economic health for others. 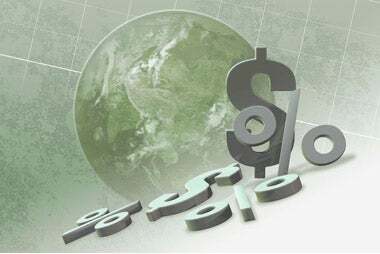 To support the current account deficits of countries around the world, the global economy must be strong enough so that exports can be bought and investment income repaid. Often, however, a current account deficit cannot be sustained for too long – it is widely debated whether the consumption of today will result in chronic debt for future generations. 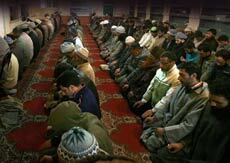 Kashmiri men offer Friday prayers at the Ahl-e-hadith mosque in Gawkadal, Srinagar. The famed Sufi tradition and spirit of Kashmiriyat in the Valley, already ravaged by decades of insurgency, faces a new challenge. Wahhabism, an austere, puritanical interpretation of Islam promoted by Saudi Arabia, is making deep inroads into Kashmir due to the efforts of the Jamiat Ahl-e-Hadith, which calls itself a religious and welfare organisation.Swelling congregations flock to about 700 mosques that the organisation, which registered itself way back in 1958, has built across the Valley. Practically every village along the picturesque, poplar-lined, 60-km stretch northwest of Srinagar towards Gulmarg has one or more Ahl-e-Hadith-funded mosques. The new mosques and their attendant madrassas make for a contrasting picture with the hundreds of dilapidated mosques built over centuries in the age-old Sufi tradition. Unlike worshippers at the older Sufi shrines, Ahl-e-Hadith mosques are overtly more conservative: women wear burqas or at least a headscarf, while the men sport beards and don skull caps; their traditional salwars end just above the ankle in accordance with Wahhabi tenets. Jammu and Kashmir (J&K) Police and Central intelligence officers say Ahl-e-Hadith’s funding comes primarily from Saudi Arabia. Based on US intelligence, they believe that the House of Saud, rulers of Saudi Arabia, had in 2005 approved a $35-billion (Rs.1,75,000 crore) plan to build mosques and madrassas in South Asia. “Wahhabi groups across Jammu and Kashmir were beneficiaries of this largesse,” says a senior police officer. Scarf-clad students at the Salafia Muslim Institute in Srinagar. Intelligence sources say Saudi charities and private donors route zakat (charity) money to J&K through illegal hawala channels. It increases during the Eid season. Whenever mosque managements are questioned about it, their explanation is that it is donation or goat-skin money. All organisations registered under the Foreign Contributions Regulation Act (FCRA), 1976, have to submit their annual balance sheets to the Ministry of Home Affairs (MHA). “Not one organisation registered under the FCRA in J&K accounted for money coming in from Saudi Arabia,” says a senior MHA official. However, there is no way to keep track of funds received by organisations that are not registered with MHA. Most of the organisations, which have contributed to the growth of Wahhabi and Ahl-e-Hadith movements in Kashmir, are not registered.Sources in the Intelligence Bureau admit that they are aware of the large-scale illegal funding, but add that they cannot do much due to the sensitive internal situation. “We have taken up the issue several times with the state police but nobody wants to get into it. It suits them to ignore it,” claim sources. Paramedics at a diagnostic centre run by the Jamiatahl-e-Hadith in Barbarshah, Srinagar. Admitting massive cash inflows to the Valley, a senior state police officer says that the bulk of the illegal funds meant for Wahhabi groups and other hardline factions are physically transferred across the Line of Control and and at the trading station in Uri in the form of hard currency-both real and fake Indian currency notes-taking advantage of the barter trade being permitted between J&K and Pakistan-Occupied Kashmir. “Checks by customs officers are at best cursory. There are no X-ray machines and other standard international border control equipment. The army merely observes the goings-on,” he says. The officer adds that it is impossible to quantify the smuggled funds and that no agency-Central or state-has made any effort to do so.What concerns police and intelligence officials more is the possibility of Lashkar-e-Toiba and Tehreek-ul-Mujahideen militants relying on Ahl-e-Hadith members to provide them hideouts. “Indoctrinated Wahhabis are the least likely to turn in Islamist militants to the police,” says a senior intelligence official. Scarcely visible a decade and a half ago, Ahl-e-Hadith now claims over 15 lakh members, over 16 per cent of Jammu and Kashmir’s Muslims. Besides the 700 mosques and madrassas it built, Ahl-e-Hadith is believed to have funded 150 schools, several colleges, orphanages, clinics and medical diagnostic centres. It has also proposed a Rs.200-crore Islamic university, Transworld Muslim University (TWMU), in Hyderpora, Srinagar, affiliated to leading Saudi institutions. The proposal was referred to a select committee after state Congress chief Saifuddin Soz opposed it in the Legislative Council on October 9, 2010.TWMU is planned as a multi-disciplinary institution with a stated mission to “facilitate a new generation of leaders in medicine, science, technology and religion based on the ShariahÃ¢”. Ahl-e-Hadith is already engaged in setting up key faculties within its existing institutions across Srinagar. Accepting responsibility for halting the proposal, Soz was reticent about his reasons for refusing permission, since the proposal was cleared in February 2008 by then Congress Chief Minister Ghulam Nabi Azad. Official sources claimed it was blocked, following intervention by J&K Governor N.N. Vohra on the advice of security agencies. Both the ruling National Conference and the Opposition People’s Democratic Party (PDP) had supported the bill. PDP head Mehbooba Mufti cautions that any decision to scuttle the university must be preceded by a thorough investigation into Ahl-e-Hadith’s sources of finance. “A knee-jerk response could be dangerous. After all, the organisation is doing a lot of good work and has a considerable following,” she says. Wahhabi codes run counter to the age-old Sufi tradition. Wahhabis forbid invoking names of prophets or ‘pirs’; Shrines are viewed as ‘deviant’ and forbidden. Stringent dress codes are prescribed for both men and women. Men must grow beards, wear a prayer cap and keep trousers just above their ankels; women must observe purdah. Music and dance, even loud laughter and demonstrative weeping at funerals, is actively discouraged. Alcohol, tobacco and other stimulants are prohibited. Women are dissuaded from working except where their families are in financial distress. Gender segregation is actively enforced. Men and women are discouraged from socialising in public forums. The organisation’s rapid proliferation and increasing popularity among youth is making Kashmir’s predominantly Sufi-Hanafi community anxious. “Opportunities for better education and secure future draw young Kashmiris for whom Ahl-e-Hadith represents a new, untested alternative,” says CPI(M) legislator Mohammad Yousuf Tarigami. The conservative Jamaat-e-Islami, too, is nervous at the prospect of ceding political ground. Ahl-e-Hadith’s feisty General Secretary Abdul Rehman Bhat, 65, insists, “Delhi is unwittingly playing into the hands of separatists like Syed Ali Shah Geelani, who are opposed to our university.” Hurriyat leaders Geelani and Mirwaiz Umar Farooq belatedly voiced support for the university in a joint statement in November. Non-committal on the Wahhabi proliferation, Geelani says the greatest threat to Kashmiriyat is from “the occupation forces deployed by India”. But Tarigami says Ahl-e-Hadith is contrary to the Jamaat’s ideological framework: “The Jamaat- e-Islami leadership perceives a dilution in their own brand value.”The Jammu and Kashmir Peace Foundation (JKPF), a Hanafi organisation devoted to reviving historic Sufi shrines, believes that a sinister process of “fundamentalist indoctrination” is under way in Wahhabi madrassas and schools. Based on a district-wise count, JKPF’s Chairman Fayaz Ahmad Bhatt, 40, says nearly 7,000 mosques, including 911 in Srinagar, preach the orthodox Wahhabi brand of Islam. Kashmir’s non-Muslim minority, too, views the Wahhabi ingress as a “conspiracy to Talibanise Kashmir”. “The Taliban had also sprung from Pakistani madrassas funded by the Wahhabis,” says former Kashmir University professor Kashi Nath Pandita. Ahl-e-Hadith leaders vigorously deny all links to Islamist extremist groups. “We are more liberal than those that criticise us,” says Bhat. He points out that former Ahl-e-Hadith president Maulana Showkat Ahmad Shah was assassinated by Tehreek-ul-Mujahideen militants outside a mosque in Srinagar’s Maisuma locality on April 8 because he opposed extremism. Bhat talks about the Ahl-e-Hadith-run English coaching institute for adolescent girls just above his Barbarshah, Srinagar, office and the diagnostic facility and pharmacy on the floor below that offers services at concessional rates. “No one is turned away, not even CRPF (Central Reserve Police Force) jawans,: he says. He also points to the Salafia Muslim Institute, the co-educational school with 800 children on Srinagar’s airport road in Parraypora. “We get strict about scarves for girls only after Class VI,” says Principal Mufti Altaf. Students are segregated by gender after Class II. Ahl-e-Hadith has two registered charities that are eligible to receive foreign funding under FCRA. But the organisation denies receiving any Saudi money after 1996. Bhat, however, admits there are grants and scholarships for students to go for studies in Jeddah. He claims that the money spent on building new mosques and schools is raised via zakat. The total annual collection from all 700 mosques Ahl-e-Hadith claims to run across the state is around Rs.2.5 crore. Even if one were to accept Bhat’s claim that it costs them only Rs.10 lakh to build a new mosque, the organisation would have ended up spending much more in building the 350 new mosques it has since 2004 than what it gathered through zakat. Mehbooba is not overly worried about the Wahhabis because she believes Kashmiris would never surrender their inherent freedom so easily. “Sufism is not merely a religious belief but a way of life. Women here did not take to the burqa even when militancy was at its peak,” she says. Her confidence is cold comfort, given the rapid growth of the Ahl-e-Hadith’s influence. THIS is apropos of the news item ‘SBP keeps interest rate unchanged’ (Feb 9), reporting 25.60 per cent increase in domestic debt and simultaneously assuring that ‘the economy has sufficient reserves to meet its debt obligations’. While many have reason to disagree with such a contention, it is important to consider debt beyond the simple equation of ‘reserve-based paying capacity’. For a highly indebted economy such as Pakistan’s, there exists a narrow range of three options to manage its debt portfolio: a) raising the rate of growth above the rate of interest, b) defaulting on a large proportion of the public debt and going into bankruptcy, c) wiping out of debts via currency depreciation and inflation. Making a choice out of these involves far-reaching impact on the lives of the people and growth prospects of the state. Policymakers in Pakistan have invariably chosen the third option, employing ‘inflation’ as a ‘political phenomenon’ and, thereby, creating forms of debt that, by design, are being shifted to the next generation of the poor and lower middle class. The ‘cognitive elite’ that, according to Charles Murray, is congregated in a few ‘super zip codes’ has benefited exponentially, while the poor has incurred inter-generational liabilities. There were a series of attempts in 1692, 1694, 1696, 1704, 1708, and 1715 to avert such exploitation in England. From 1689, the parliament embarked on wide-range reforms, controlling and improving taxation, auditing royal expenditures, and effectively prohibiting debt default. Douglass C. North, Nobel laureate, argues ‘the real significance of the glorious revolution lay in the credibility that it gave the English state as a sovereign borrower’. Pakistan’s incoming parliament needs a constitutional solution to the debt problem. A solution with wide-range reforms that reduce the discretion and ensure that the elite’s profligacy is not at the expense of the poor. Really Pakistan has few resorts and Snow SHUTS them down ! Amazing. “….ISLAM actually had a very advanced civilisation hundreds of years before the western world caught up from about the 1600s. Wikipedia really does provide correct unbiased history of Muslims.